Hey, guys! What's up? So I made this illustration to study painting and storytelling. It's finished but I think I could do it better: c Can you guys give me some tip's about it? 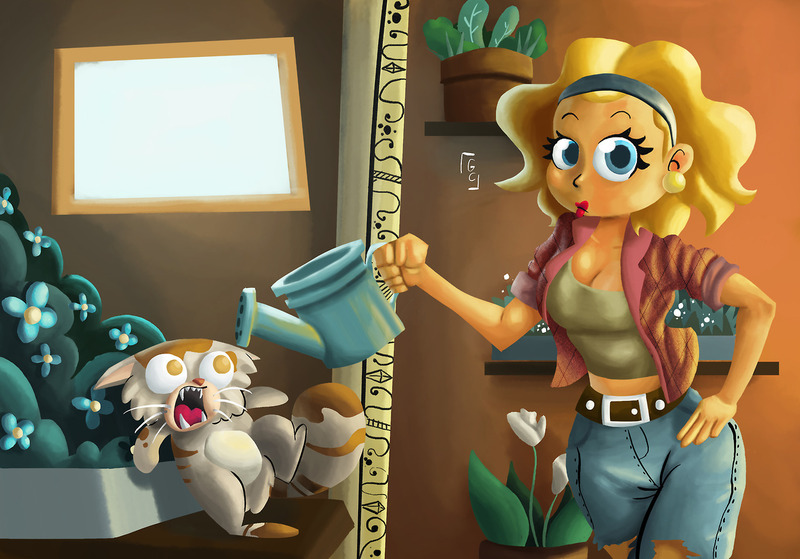 The story is that this girl is watering her little garden, something catch her attention and accidently she'll watering her pet. I like it! Nice coloring and drawing. Some quick comments: she doesn't look startled enough. If she is watering her plants her body should be facing the plants, and she'll look to her left then, maybe her left hand (the one without the waterthing) in front of her mouth. Her hair might jump up? Her right eye is bigger then the left one, which is good, only her, pardon me, breasts are the other way around, which is slightly weird. Love all other perspectives though! And i love the cat! Nice painting! I love the colours. the cat's expression is perfect. I agree with Dennis, her posture need to be facing the plant but I think to fit your story can keep her face with this distracted look. Maybe add some water over the cat? I would also remove that line down the middle, it seems to split the piece in two vs having it one piece. The flowers in the background behind the lady should also be moved up above here or removed. My eye is pulled into the curve of her shirt and the flowers. Or maybe change the curve of the shirt so it doesn't seem to frame the background. @Chip-Valecek thanks for the feedback. You're right. In that line i was trying to make an architecture detail. Maybe the line came out too large, or too strong. I understand what you said about the flowers on the back. I wished that the eyes of the viewer was drag to her face and the cat Thanks for helping. I would remove the window or do something to lessen the contrast. I assume this is done in PS, put a black and white filter over it and you will see what I mean. The space between the water can and the can is a little tight. I really like the cat but I'm not sure about the eye color, maybe go a little darker to help so of the surprise/ fear expression. His eyes reminds me of Ren when his eyes go bug all eye crazy. if she is distracted, I would have her looking even further to her left, out of the frame. The way she is now, looking at the viewer, gives the feeling that she has already discovered her mistake. Divide the window into panes to break that up a bit, and maybe put a mouse up there, laughing at the cat. The cat needs pupils in his eyes. Would help reinforce the direction he is looking and look more natural. Also, the white area on the cat's belly looks odd. @Guilherme-Cavalcante Fun piece The hip seems a little wonky to me. Maybe some of the other proportions too. I think it's okay that she's looking away because she is apparently not paying attention or she wouldn't be watering the cat! Fun piece. I agree with what a lot of the others have said. I would include some water. It doesn't have to hit the cat. It could be splashing a bit out of the top, and little drops could be barely coming out of the spout. It will increase the tension of what is about to happen. She doesn't look distracted. She looks kind of like a 1950's pin up thinking "Look at this naughty thing I'm about to do!" If you want her to look distracted, maybe she could be looking at a cell phone, or you could indicate someone knocking on the door. There's some inconsistencies with the way you've chosen to render. Specifically the random linework and your highlights. I would either get rid of the linework completely, or carry it in more places throughout the piece. As for the highlights, I would also keep them more consistent. There is a bold graphic quality to the highlight in her eyes that I think you could include on other object in the piece. . . the watering can, her belt, her earrings, her lips, and the cat's eyes. Maybe her hair as well. Any smooth, shiny surface, basically. The plants behind her are popping out for attention and creating problems with depth. I would demphasize them. Less contrast and rendering perhaps. Overall though, it's pretty great. You can tell you put a lot of thought and time into it. Well done! More and darker occlusion shadows on the cat and woman. Right now the background occlusion shadows are much more dominant and contrasted and it's not working in favor of your focal points. @TessW Thanks! You help me a lot. I didn't knew that leave the linework was a problem. In some points of the drawing i just couldn't rendering so i leave the line. I always do this on my drawings. I'll try to change. The thing about the eyes it's that i tought in her face as my focal point. So i try to make her eyes and her face with more saturate colors. But i see now that i should make in other parts too. Thanks for the feedback.